A few of the positive highlights for SolarCity Corporation this year. 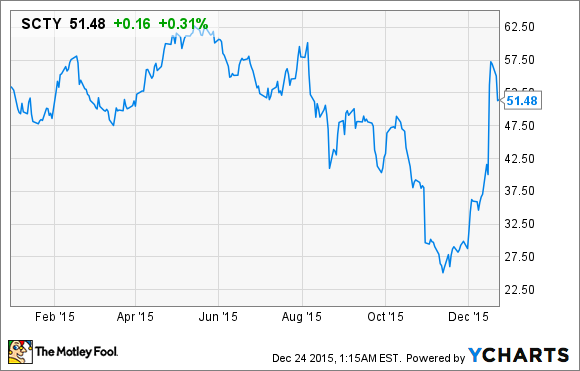 2015 probably wasn't a year SolarCity Corporation (NASDAQ:SCTY.DL) investors will look back on fondly. The company lowered growth targets, showed increasing sales costs, and continued to post large losses each quarter of the year. If it weren't for the spike in shares after Congress extended the solar investment tax credit, the stock would have had a terrible year. But long term, the steps SolarCity made to become a more sustainable company could prove to have a longer-lasting impact than any of its negative headlines. Here are the three things I think investors should remember when looking back on 2015. When SolarCity bought Silevo in 2014, it was taking a big risk by getting into solar panel manufacturing. Making solar panels has been a very high-risk business that has lost a lot of investors money, and there was no guarantee that SolarCity could make high-efficiency panels for the low cost Silevo claimed it could achieve. Half of that equation was answered in 2015, when SolarCity said it had made a panel that was 22.04% efficient, among the best in the industry. Not all panels will be quite that efficient from Silevo, but this exceeds the 15% to 17% efficiency that most solar panels coming from China are at today. We still don't know if SolarCity can meet its own cost target of about $0.55 per watt, but knowing it's executing on the efficiency side has to be a relief to investors. Large commercial projects are playing a larger role at SolarCity. Image source: SolarCity. One of the biggest risks in SolarCity's business model has long been its focus on the U.S. residential solar market. The company diversified away from that in August when it acquired ILIOSS in Mexico, a developer of commercial solar projects. Not only does this give SolarCity some exposure outside of the U.S., it expands the company's commercial business as well. It introduced the ZS Peak system for commercial rooftops in 2014, and growing the commercial business has been a focus for the entire organization. The U.S. residential rooftop business is a big opportunity, but it also presents a lot of risk if it's SolarCity's only focus. That's why the ILIOSS acquisition was such a big deal, and why it was one of the top headlines in 2015. When SolarCity's stock dropped following third-quarter earnings, the market was largely looking at growing sales costs and slowing growth as reasons to sell. But along with the weak guidance, management also said it planned to be cash flow positive by the end of 2016. Long term, that could prove to be more valuable than growing for growth's sake. SolarCity's pitch to investors has long been that it will be a cash flow machine once it stops investing in growth. It has $8.9 billion in contracted payments and $2.2 billion in contracted retained value, according to its own calculations. But those positives are overshadowed on the income statement by costs associated with operating the business and financing solar systems. If growth indeed slows in 2016, it would allow SolarCity to show that it can indeed be a cash flow machine, potentially reaching cash flow breakeven by the end of the year. For investors questioning the stock's value, that would be a positive sign that SolarCity can live up to the value it says it's creating quarter after quarter.